Tired of hearing "It won't run on a Mac"? Our Mac charting and trading software has won awards in the annual Stocks and Commodities reader's survey in BOTH the "Trading Systems Stock" AND "Trading Systems Futures" categories making it the highest ranking Macintosh program for seven straight years. Reviewed and praised by leading financial publications including Barron's, Futures Magazine, Shares and Stocks & Commodities Magazine, Trendsetter customers remain the envy of their friends that chose the wrong computer. Not just charting software or trading software, software that helps you make the decision on when to buy and sell and it's made for your Mac! Whether you want to trade stock, futures, ETF, or FOREX, let us show you how easy and reliable charting, trading and market analysis is with the help of Mac OS X and the best investment software. Discover the difference... choose from the most comprehensive market analysis software available! All exclusively designed for the Macintosh. Buy with confidence knowing we back our products with a 30 day satisfaction guarantee. 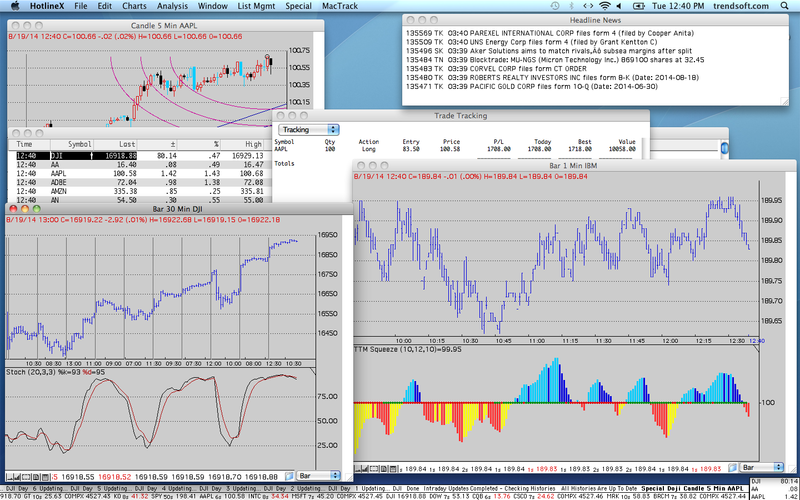 Stock, futures, ETF, or FOREX... let us show you how to TURBOCHARGE your trading using your Mac. C e l e b r a t i n g 3 0 y e a r s o f c u s t o m e r s a t i s f a c t i o n ! Personal Hotline has always been a "must have" for any serious trader/investor. Now, we've created a special version that merges the streaming, real-time capabilities of Pro Analyst with the unique system modeling features of Personal Hotline. Introducing the ultimate trading tool...HotlineX! an incredible array of charting and analysis tools, access to streaming data plus powerful additions designed to give serious traders the edge... You don't need to be a day trader to appreciate streaming real-time charts, advanced technical analysis, alerts, market-pulse reports, news and more all in real time! Track your choice of symbols, stock, futures, ETF, and foreign currency, trade by trade, minute by minute. line, bar, candlestick and Haiken-Ashi charts. 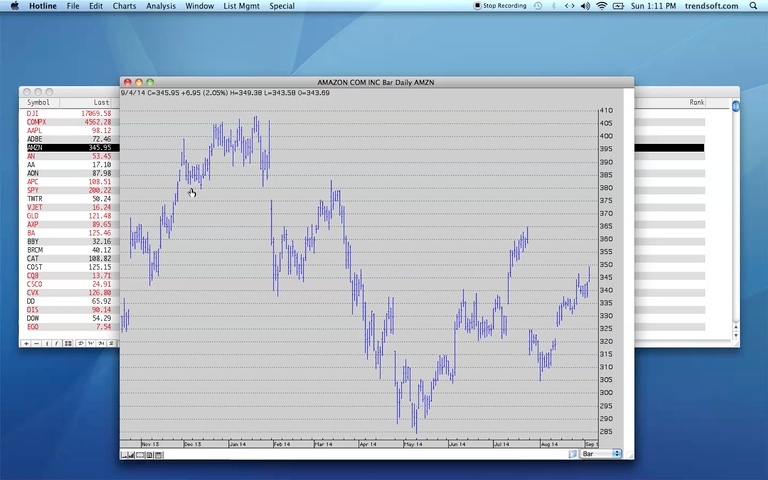 All charts update in real time, with each reported trade, regardless of time frame. Click here for more information on HotlineX. any version of OS X including macOS Sierra (10.12), the latest from Apple. Personal Analyst, Personal Hotline, Pro Analyst, HotlineX, MacTrack, MacChart and DayTrader are trademarks of Trendsetter Software, Inc.